I admit I was fooled. Sort of. 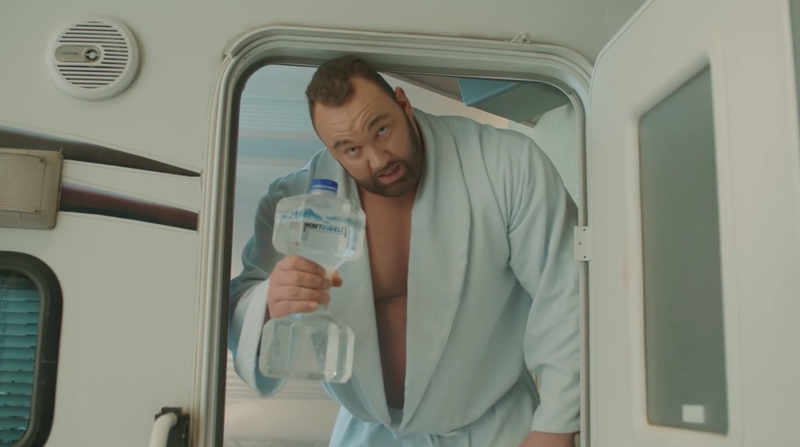 When I saw Thor Björnsson (aka, the Mountain That Rides, aka the Strongest Man on Earth) selling his new sparkling water called HeavyBubbles in the spot below—released on April Fools' Day—I thought it was a prank by HBO. I expected they might actually start releasing limited-edition dumbbell water bottles. But it turns out the whole high-production value prank was created by SodaStream, which released an extended video (below) explaining the connection later in the day. It also came with a new SodaStream tagline: "F**k plastic bottles." I think part of the reason it fooled me is that it's not an entirely implausible concept. Water is heavy, and we cart an increasing amount of it home from the store. In fact, Pepsi Light tested (though didn't release) tested its own dumbbell bottle recently. It also helps that Björnsson is legitimately charming when he's not gouging out eyes on Game of Thrones. The hilarious spot features the Icelandic superman hawking his product to an adorable admirer, wavering between his homicidal onscreen persona and his pleasantly chipper off-screen self. Some April Fools' pranks are elevated higher than a quick Photoshop of a nasty Cheez Whiz flavored milkshake. Some are actually clever, playful advertisements in disguise that hit on a product benefit, but with an absurd enough premise that there's only one day they could be released without mucking up the entire brand ethos. This was one such ad. SodaStream's everyday slogan, by the way, is "Set the bubbles free," voiced by a woman who sounds like she just spent the whole afternoon lounging around a million-dollar pool. But it wouldn't be amiss for SodaStream to keep Björnsson around for another few spots. There's something about the world's strongest man being into sparkling water that delights and surprises, especially when he is also fond of smashing through walls—including the fourth one.